“Today’s report on hallway medicine confirms that we will need innovative solutions to ensure quality health care continues in Ontario. The number of people being cared for in hallways is unacceptable. 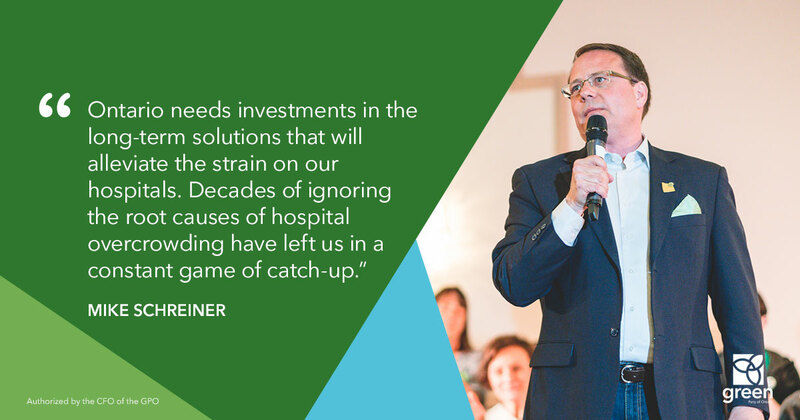 It’s clear that investments in community-based solutions and preventative health care – two solutions the Green Party has pushed for years – are needed to address the root causes of hospital overcrowding. As this report confirms, we need to make sure that health care options, particularly for mental health and long term care, are available in the community outside of hospitals to free beds for acute care. This includes primary health care reform with more community health centres, nurse practitioner-led clinics, and family health teams. Better community-based care, not cuts, is the solution to hallway healthcare. As the government approaches their first budget this spring, I urge them to offer more than band-aid solutions. Ontario needs investments in the long-term solutions that will alleviate the strain on our hospitals. Decades of ignoring the root causes of hospital overcrowding have left us in a constant game of catch-up.